From left are Putnam County Commissioners Michael Lammers, John Schlumbohm and Vincent Schroeder discussing plans with Joe Hohlbein, Putnam County Recycling Center supervisor, to hire two full time employees and move the recycling operations to a larger building at its existing site. 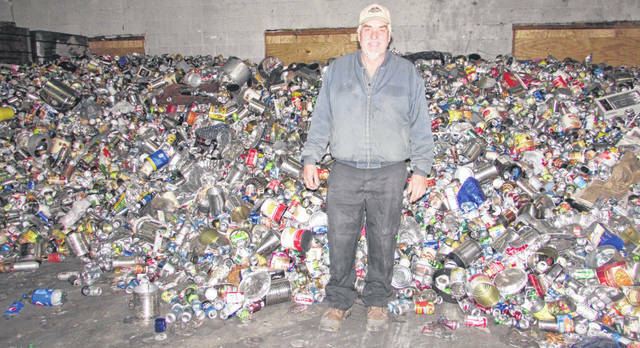 Joe Hohlbein, Putnam County Recycling Center supervisor, stands in front of recyclable materials at the existing Ag Annex Building at the fairgrounds. There is a proposal for the recycling processing to move to a larger building at the current location on Second Street at the fairgrounds. OTTAWA — Moving Putnam County recycling processing to a larger building at the fairgrounds and hiring two full-time employees will assist with efficiency and space. Putnam County Commissioners Thursday heard from Joe Hohlbein, Putnam County Recycling Center supervisor, who provided an update on the project. He said he would become full time and he has another person who is interested in working full time at the recycling facility he will let the commissioners know about Tuesday. Hohlbein is currently part time and he currently has four other part time employees that include truck drivers. The location where residents drop of recycling will not change and will continue to be at the Recycling Center on Second Street where recycling bins are located. Residents can continue to drop off glass, aluminum, plastic, cardboard, metal and paper. Video cameras will continue to be located on site to prevent people from dumping garbage in the recycling bins. The recycling processing is currently located at the Ag Annex Building and will be moved to another building 100 feet away that is a larger building with higher ceilings. “Right now we have to take the recycling containers approximately six miles out of town to dump into an open top container. We then put a tarp over the container and bring it back to the building at the Ag Complex at the fairgrounds using a skid loader to unload the recycled materials one bucket at a time,” Hohlbein said. With the recycling being moved to the larger building, a truck can be backed in where recycling can be dumped that will save a lot of time and expense. Vincent Schroeder, commissioner, said the current process is inefficient. Having the new facility will allow the recycling materials to be dumped on site. The recycling will continue to be sorted and baled in Putnam County at the Ag Complex. “We are moving the processing from a building that has low ceilings to another building with higher ceilings that is a building within the Ag Complex,” Schroeder said. Currently the recycling center is falling behind with part time employees it has and piles of recycled items are collecting. “The recycling needs to continue and we have to be able to bale it as it comes in,” Schroeder said. Michael Lammers, commissioner, said if recycling can be moved to another facility it will avoid driving out the recycled materials to the landfill. “We are committed on recycling and we want to make it more efficient and see a better return on our investment,” Lammers said. For more information about recycling in Putnam County call the Putnam County Recycling Center at 419-234-2186.